Since 1975, Homeward Bound, Addison County’s Humane Society has provided shelter for lost, abandoned, abused or surrendered animals. Their programs and services meet a wide array of critical animal welfare needs, including support for humane law enforcement, humane education and outreach, lost and found services, low-cost micro-chipping, emergency foster care for people in need, and a program matching senior citizens with senior animals. 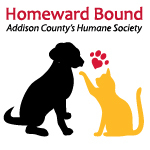 Homeward Bound serves approximately 850 animals each year, and ensures that every adoptable animal finds a permanent home.